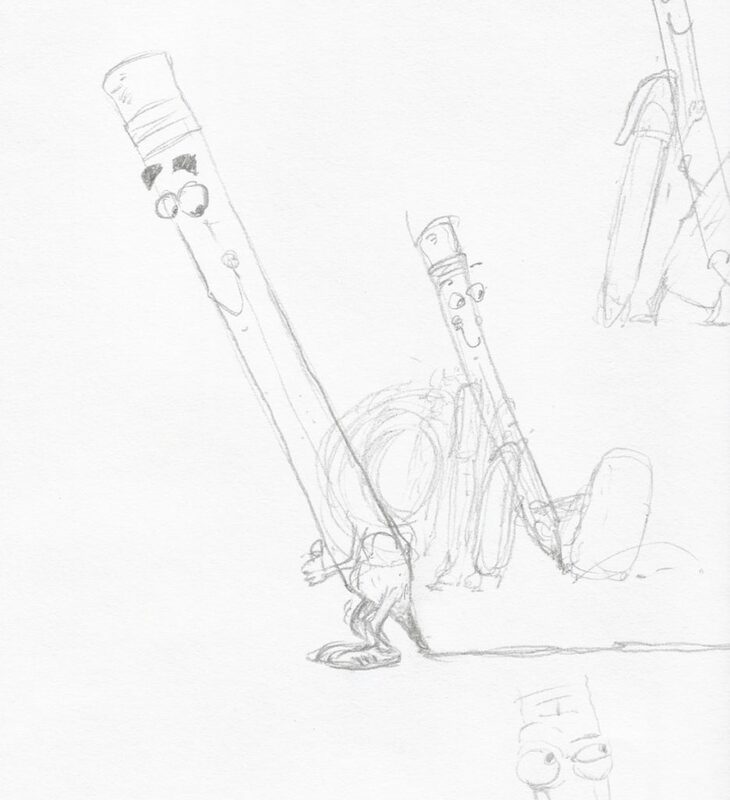 Home Uncategorized Hello, PENCIL! Plus interviews with its creators AND a GIVEAWAY! A few years ago, I was fortunate enough to get look at a manuscript written by my friend Ann Ingalls. Right away, I knew it was something special. It was just one of those stories that grabbed you on the first page and had you giggling throughout. 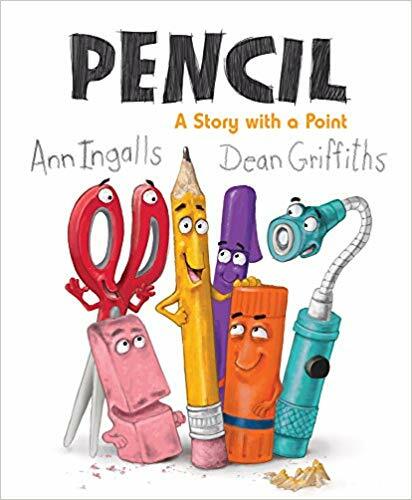 So you can imagine how great it feels to be able to share with you in book form, now hilariously illustrated by Dean Griffiths, PENCIL, A Story with a Point. Yippee! I don’t like to give away an ending, so please go out and find this one to share with your kiddos! But right now, both author and illustrator are waiting to give us the inside scoop. Jill: Ann, do you remember what sparked this zany idea? Ann: Actually, I was cleaning my kitchen cabinets and drawers and got caught up in all that I saw in my junk drawer. I pulled out a bunch of items and began to imagine what if any personality each of them might show. Of course no book is written without a bit of research. I googled images of junk drawers. Each one looked like a sort of neighborhood for school supplies, hardware, makeup and personal items, etc. I imagined a handful of “characters” who had been crowded and cooped up in the dark drawer. If one or more got out, what might that larger life be like? Jill: Now that sounds like fun research! Did you sit down and make a list of all the puns you might use, or did most of them come about while revising? Ann: After I selected my characters, I searched for and wrote some of my own puns. In a way, the puns decided the direction the story would take. My sister, Maryann Macdonald, and I have written a picture book story that takes place on a farm. Lots of puns in that work as well. Not sold yet, but we’re hopeful. Jill: I’ll keep my fingers crossed. Between your initial start and that “YES, we love it!”….how long? Any rejections/suggestions along the way that were helpful? Ann: I did not have an agent at the time that I was submitting PENCIL. I only sent it to three publishers. My dear friend and critique partner, Jody Jensen Shaffer, suggested Pajama Press. They held it for about a year and a half before committing but were encouraging all through that wait. My editor, Ann Featherstone, has been an absolute delight. and Dean’s fabulous artwork takes the story to a whole new level. The very biggest boost I got while revising that work was from Jane Yolen and Heidi Stemple. 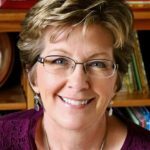 I attended a Picture Book Boot Camp with them. They loved the story from the beginning and made several suggestions both of which I accepted. They are the BEST, BEST, BEST! I could pinch their darling cheeks, I love them so. Jill: Wow, lucky you! Okay, Dean. You’re up! 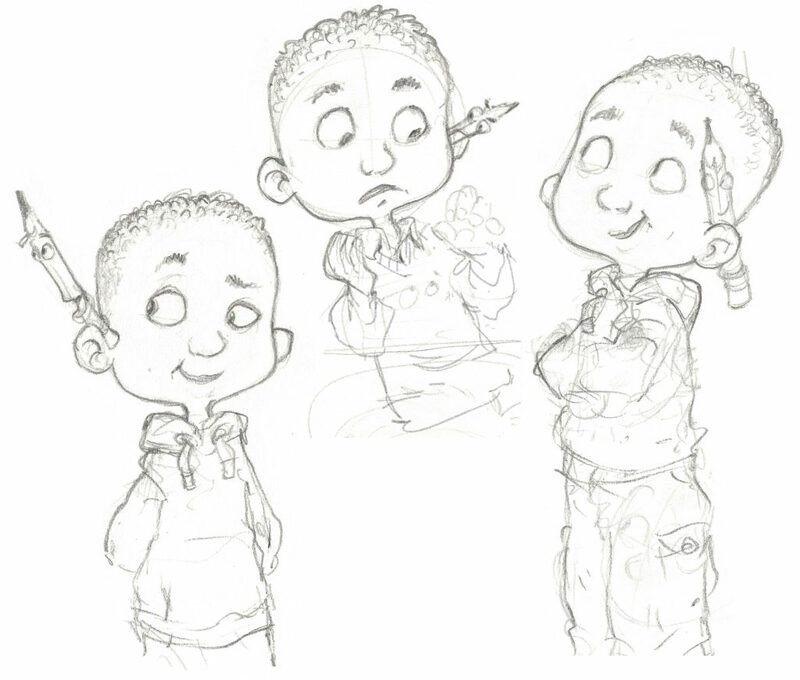 Could you tell us about your illustrating process? 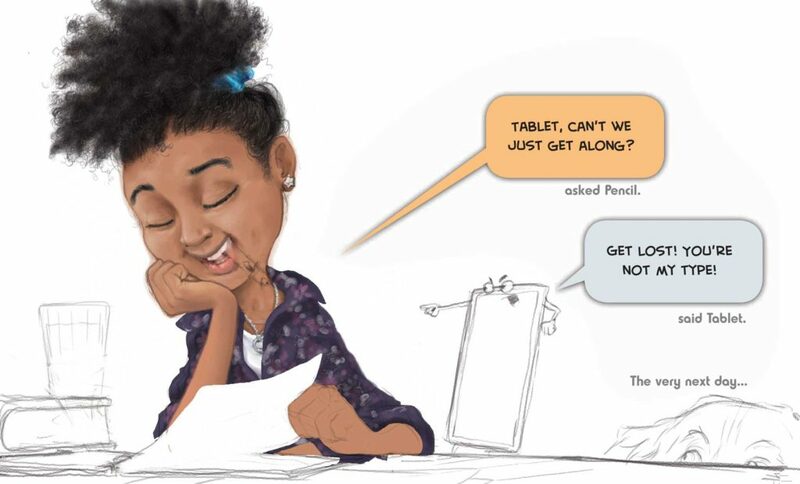 Dean: As an illustrator, the wonderful thing about working with a writer as brilliant and funny as Ann, is that the writing makes it so easy to visualize the characters, so the first thing I did after receiving her manuscript was to sketch them on paper. You can see that Jackson and Pencil looked a bit different than how they ended up. After the characters are figured out, I layout the pages roughly in Photoshop, with the text in place. In Photoshop I’ll start adding the colour and do more refining of the drawing. Sometimes, if I’m having trouble with a character, I’ll go back to paper, redraw it, scan it at a high resolution (usually 600 dpi) and fit it in Photoshop. Jill: Did you run into any particular challenges in depicting anthropomorphic office supplies? Dean: The only tricky part of anthropomorphising the supplies was where to place their eyes, mouth and arms. At one point I had pencil with his face at the eraser end, but that was not a really great idea. Jill: Ha! I can see the problem. Okay, one last question, this one from Ann, who loves your choice of including a Bernese Mountain Dog. What tipped the balance in favor of that breed? Dean: Thank you Ann! It had to be a big, slobbery dog (like My Newphie, Samantha, that I grew up with) and a darker colour so he would stand out nicely from the stark white background, and they are a beautiful breed with the lovely mix of warm brown and white markings. Thanks so much, both of you! Readers, if you’d like to WIN a copy of PENCIL, A Story with a Point, just leave a comment for Ann and Dean below. We’ll draw a name at random on Feb. 22nd and let you know if YOU are the lucky one! 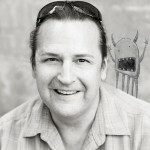 Meanwhile, you can see more of Dean’s art on his website, here. Learn more about Ann here. Speaking of lucky…we have a WINNER to announce! 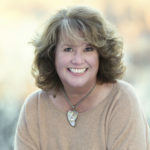 Ashley Congdon is the winner Lori Degman’s new book, JUST READ, from the Jan. 29th post. Ashley, please email Lori through her website (http://www.loridegman.com/) and provide your mailing address. Congrats! Ann Ingalls, Dean Griffiths, Jill Esbaum, Pajama Press, Pencil. Bookmark. This looks adorable! Thanks for the chance to win! I love the puns already and the illustrations. Congratulations. I love puns and this book looks like they are in abundant supply (see what I did there?) What a fun story, and timely too. Plus, it’s good to hear that sometimes manuscripts take quite a bit longer until “Yes”! Friendship stories are the best add in great puns and fun art and you have a winner! Looking forward to reading this! Thank you, sweet Jill, for your kind comments about this silly work of Dean’s and mine. I look so forward to someday meeting Dean. Let me suggest that we all stay home and read, cozy in our pajamas. Hilarious! I love all those puns! Thanks for sharing! Love this book! Thanks for showing us behind the scenes on the research and art. Thanks for the peek behind the scenes! Nothing can replace a sharp pencil and (recycled) paper. What a fun idea! Enjoyed reading about how the story and illustrations developed. Congratulations Ann and Dean!!! Hi Judy! Nice to see you here! This is my favorite kind of book to read. I love word play and have to get a copy of this clever book. The illustrations are awesome! Love this! One can never have too many puns. I’m going to go through my junk drawer right now and see what I can find. Wow! Looks like such a fun, creative story. I love stories full of puns! Congrats to both of you! Puns make me chuckle, and I love to chuckle. And I love the illustrations! I can’t write this one off – it looks great! Love the punny humor 🙂 Congrats on a wonderful book! Congratulations, Ann and Dean! I was already a fan of Ann’s work and I look forward to reading about Pencil and his friends. My father was a lover of puns and it seems to be in my genes, so I will make a point to have my wit sharpened in this read. I’m a fan of yours as well. All best and happy Tuesday! I’m lead to look for this book! This looks delightful! I look forward to finding it. good up beat post! Thank you! Holy cow!! This looks terrific! And as the creator of Microsoft’s Clippy the Paperclip, I MUST have this in my collection! I love the very idea of Clippy! I can’t wait to meet him! Fun puns for both kids and adults. Love the illustrations too. Wow, so clever! I’m going on the hunt for this delightful and funny book! Cannot wait to read this one! Love the concept and the illustrations. Thank you so much for sharing the process! I just love the brilliance of writers and artists. What inspiration! This book looks very cute! Thanks for sharing. Thank you for the post, Jill! I love Ann Ingalls! She is a wonderful human being and an exceptional writer. Can’t wait to ready this punny story! Dig the process photos as well, Dean. Have a happy Tuesday, everyone! Thank you so much, Brian. Happy Tuesday right back! Looks like a fun story! Can’t wait to read it. Love it! I thought of my own drawer stuffed with pencils, pens, markers, scissors, etc. and realized that it represents a community. I’m a sucker for puns. This looks like a fun book! Thanks for the great interview, Jill. Who knew a junk drawer could be so inspiring? I love it! Thanks for sharing. OMH — so cute. Just LOVE — have to find this 🙂 As the blogger at My Word Playground you can tell I’m a lover of puns! Wow, thank you! 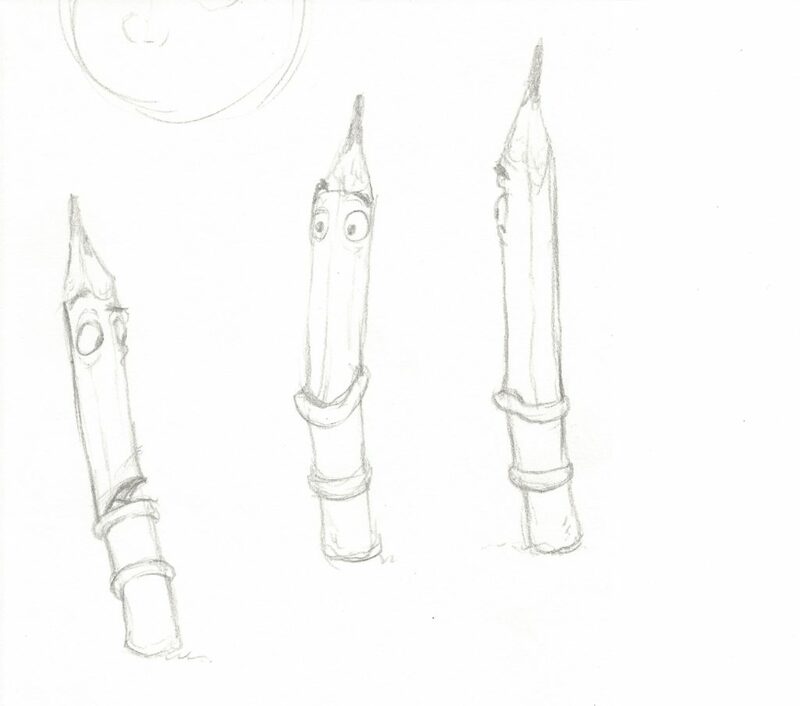 This book, PENCIL looks hilarious and something anyone can relate to. I can’t wait to read it. This looks so cute! I love good puns. Oh, Ann, I’m so happy for you! This looks absolutely DELIGHTFUL. 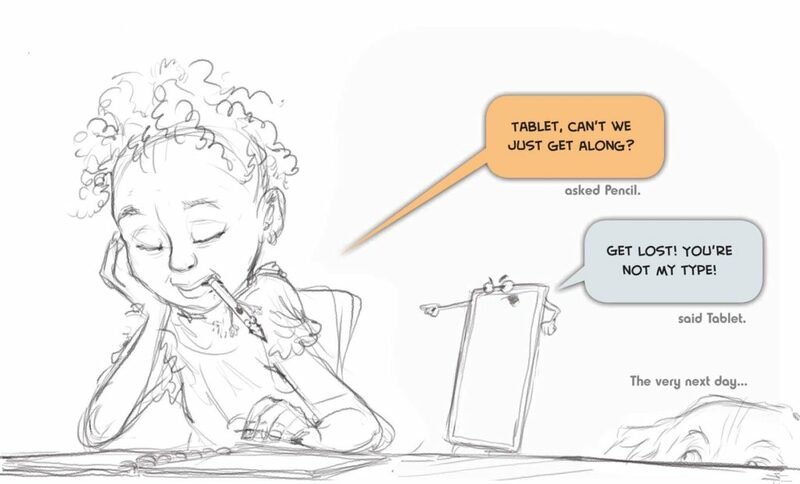 And I’m sure my kiddos will be able to relate, as they keep insisting on getting a drawing tablet and ditching the pencils. Ha! Congrats to both you and Dean! Oh, I love this whole book already. I have so many ‘junk’ drawers and it is fascinating that the contents may ‘speak’ to you and produce a story. I look forward to reading this book and sharing it with my grandchildren. Oh, my. A new book by Ann Ingalls is cause for celebration! The look looks wonderful. I can’t wait to get my hands on this book. Thanks for the post. How nice to see you here! Hope all is well with you. Very punny :). Love the drawings. Love me some Ann! Can’t wait to get my copy! Congratulations, Ann and Dean! This book! I cannot wait to read it. I love clever stories. I love the point of this story and the puns. Great book, Ann and Dean. This book sounds brilliant will all the fun puns! Best junk drawer story EVER!!! Thank you for bringing Pencil into the Spotlight!!! And the chance to win!!! I love the concept of this picture book! The illustrations are amazing! Office supplies and puns, two of my favorites! Congratulations! I just know kids will love this. What a unique way to spark a story–mining the junk drawer! Can’t wait to see this one. Great job! This looks so fun. Can’t wait to read it! Can’t wait to see this one! Thanks, Jill— looks and sounds great! OH, this looks funny! Love it! Thanks for sharing! This looks so fun! It will certainly make me look at my junk drawer in a new way. Thanks for the great interview, and congrats to Ann and Dean!